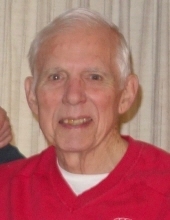 Chester V. Witt, 84, lifelong resident of Forest Park. Beloved husband of the late Marilyn R. Beloved father of Michael (Karen), Donna (Jeff) Vorreyer and Steven (Signe). Cherished grandfather of Angela, Krissy, Joel, Jessica, Dennis and Maddy. Adored great grandfather of Coco and Ezra. Visitation Tuesday 3:00pm - 8:00pm at Zimmerman-Harnett Funeral Home 7319 W. Madison St., Forest Park, IL. Funeral 9:30am Wednesday processing to St. Bernardine Catholic Church where a Mass of the Christian Burial will be held at 10:00am. Interment Queen of Heaven Cemetery. Memorials to St. Bernardine Church or St. Rita High School, appreciated. Info 708-366-2200 or www.ZimmermanHarnnett.com. To send flowers or a remembrance gift to the family of Chester V. Witt, please visit our Tribute Store. "Email Address" would like to share the life celebration of Chester V. Witt. Click on the "link" to go to share a favorite memory or leave a condolence message for the family.